Local residents in the Pacific Northwest town of Tacoma, Wash., celebrated an environmental victory Tuesday after plans to build the world's largest methanol refinery in the middle of their city were cancelled. "For us, it's a sore spot because of the legacy of industrial abuse in Tacoma," resident Doug Mackey said sitting in a coffee shop downtown, which was a ghost town at the peak of Tacoma's industrial activity. "The life cycle of industry is that they come, pollute, and then declare bankruptcy and the city has to clean up," Mackey said. Opposition to the new refinery, which would have processed natural gas into methanol to be shipped to China, had increased in recent months—creating a community of residents concerned about the plant's intense water use. Others worried about the safety risks associated with such a large refinery, which would would have been located on about 125 acres in the industrial area adjacent to the Blair Waterway. With the victory, activists said they now understood the power citizens can hold—and vowed to continue to oppose other similar projects. “There is a mobilized community now that I’m certain will be vigilant for some time,” Mackey said following the news of the project’s cancellation. The $3.4 billion plant in the city of Tacoma, Wash., was just one of three methanol refineries planned in region by Northwest Innovation Works (NWIW), a Chinese-backed joint venture. The remaining two refineries would be located along the Columbia River in the Port of St. Helens, Oregon, and the Port of Kalama, Wash.
NWIW canceled its lease with the Port of Tacoma on Tuesday—citing too many delays and difficulties with the regulatory process and environmental review, it said in a press release. However, the company said it was still committed to building the other two methanol refineries in the region. Methanol is used to make olefins, which are in turn used to make hundreds of different products including many plastics. U.S.-produced methanol is currently the cheapest in the world, sparking a hike in freight traffic transporting the product east to Asia. Methanol is used to make olefins, which are in turn used to make hundreds of different products including many plastics. U.S.-produced methanol is currently the cheapest in the world, sparking a hike in freight traffic transporting the product east to Asia. China was the U.S.’s largest supplier of goods imports in 2013, according to the Office of the United States Trade Representative—and much of the methanol sold to China returns to Americans in the form of toys, furniture, and footwear. Despite the United States' dependence on Chinese-made products, Tacoma residents stood up to city leaders and NWIW saying they didn’t want the world’s largest refinery in their city. “You could say ‘not in our city,’” Melinda Raebyne, a Tacoma resident and documentary filmmaker, told the Tacoma City Council at a recent public meeting. The Tacoma plant would have used at least 10 million gallons of water each day, the company has said. That the NWIW refinery would use more water each day than all residential customers of Tacoma's public utility district combined sparked outrage in the community and calls to city officials to halt the project. Residents, some of whom said they had never been involved in politics before, had regularly been packing Tacoma Public Utility meetings, Tacoma City Council meetings, public health meetings, Port of Tacoma meetings and neighborhood council meetings in order to get their message out. On April 12, dozens of residents opposed to the methanol refinery packed a citizen's forum hosted by the City Council. Many wore red clothes in solidarity with Redline Tacoma, an activist organization working to stop the methanol plant. Residents opposed to the planned methanol plant—many wearing the characteristic red clothes that identify them as supporters of "Redline Tacoma", a local group that has vowed to stop the project—wait to voice their concerns to the City Council. Locals from all walks of life—from chemical engineers to mothers—went up to the podium one by one to voice their concerns to Mayor Marilyn Strickland and council members. "This thing will be so much larger than anything you've ever seen—you won't believe it," Tacoma resident Steven Storms, a retired chemical engineer with 40 years of experience in the field, told the Council. The paper mills he helped design during his career would be dwarfed by the size of the Tacoma refinery, Storms said. The cooling towers on the methanol refinery alone would have emitted a large plume of steam from evaporating millions of gallons of water every day processed at around 2,000 degrees Fahrenheit, Storms said. 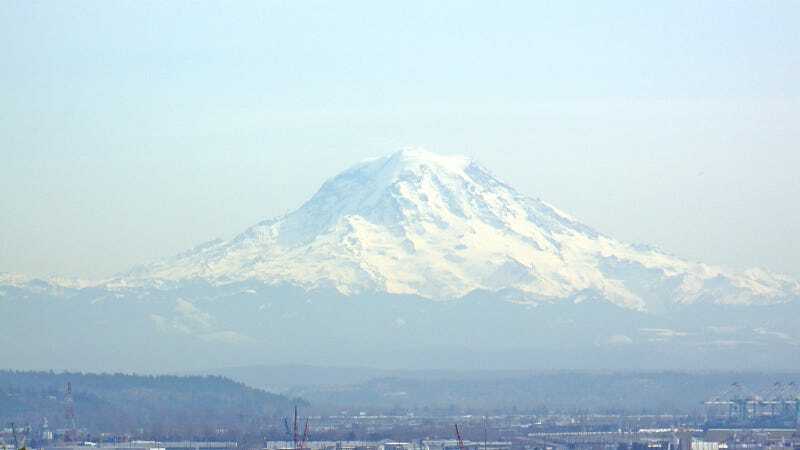 "What Tacoma does is going to affect a lot of people," said Michael Lafreniere, campaign spokesman for Save Tacoma Water—a citizen's group aimed at protecting Tacoma's water supply. Lafreniere grew up in Burion, a nearby city that experienced significant lead and arsenic contamination from Tacoma's shuttered Asarco copper smelter some 30 miles away in the early to mid 20th century. Air pollution from the smelter contaminated a-1,000-square mile area, state officials said. Although the smelter was closed over 30 years ago, clean-up is still ongoing. A sign advertises new commercial development at Point Ruston, the former site of a shuttered copper smelter that polluted the surrounding region for around 100 years. The EPA and other government agencies are still working to clean up the contaminated soil in four counties. With Tacoma still struggling to clean up contamination from a legacy of heavy industry, many residents at the citizen's forum said planning to build a large chemical plant feels like going backwards. Karen Dyer, another local resident and mother of three, said people "turned up their noses" when she said she was from Tacoma 20 years ago. But things have changed, Dyer said. Tacoma's downtown, which is adjacent to the industrial zone, has been revitalized with cafes, restaurants, and galleries. Mayor Strickland did not respond to a request for comment, but both she and Washington Governor Jay Inslee celebrated the estimated 260 permanent jobs that could be brought to the city along with the refinery. "The preliminary proposals from Northwest Innovation Works to build new methanol facilities in Kalama and Tacoma could potentially result in hundreds of good paying jobs in Washington’s advanced manufacturing and clean energy industries," an emailed statement from Gov. Inslee's spokeswoman Tara Lee said. Residents rejected that reasoning, saying they hoped a strong economy did not have to be powered by heavy industry. They asked the council to be creative in thinking of a new vision for their city. "This is not our future," Tacoma resident Todd Buckley said at the meeting. Local opposed to the methanol refinery also packed a Tacoma Health Department meeting earlier this month—which usually attracts little public attention—to tell officials of their concerns, local media reported. As a result, the Department voted to ask the city for a full human health impact assessment on the refinery before the project moved forward. Amid the mounting opposition by the local community, NWIW in February paused its environmental review as part of the regulatory process for the Tacoma refinery. The plant at Kalama is further along in the engineering and permitting phase, while St. Helen's is still in lease discussions, NWIW said on its website. "There's almost no limit to the amount of methanol China could want to produce." The company, like Inslee, said it paused the permitting process in Tacoma because of the mounting opposition. NWIW said it had failed to communicate the economic and environmental benefits of the plant effectively and promised to engage residents in the coming months, Tacoma Weekly reported. “Given sufficient time, we believe we would have been able to satisfy most of the local citizens’ concerns and questions through the public participation process, and correct a lot of the misinformation swirling about regarding potential impacts of our project,” NWIW President Vee Godley said in a statement on Tuesday. One of NWIW's top selling points on the methanol project had centered on its argument that these refineries would be "green" and that it chose the northwest because it was environmentally conscious, activists have said. That's because in China, methanol plants largely use coal. In the U.S., natural gas is often used to power the process, which has lower emissions. Additionally, the Tacoma refinery would use a new technology that would allow electricity to power the gas-to-methanol process, the company has said. Because the Pacific Northwest’s electricity is powered largely by hydropower, that would mean that by using electricity instead of natural gas, NWIW would even further reduce its overall emissions, the company had asserted. "The fact that Washington has hydro means that you're taking a very clean energy to reduce your environmental footprint, which reduces your environmental footprint even more," NWIW spokeswoman Charla Skaggs told EnergyWire. But "that's an assertion that could be challenged," said Tom Eckman, power planning director at the Northwest Power and Conservation Council (NWPCC), a regional organization that develops and maintains a regional power plan and a fish and wildlife in the Northwest. The amount of hydropower the three plants would have needed is "outside the range of what hydropower might be available from plants that might be retiring," Eckman said. NWIW did not respond to multiple requests for comment. But the company has said on its website that the facility would use "ultra-low emissions reforming technology," which would emit less greenhouse gas emissions and air pollutants than conventional gas-to-methanol plants. Instead of an effort to be environmentally-friendly, the more likely reason China chose the Pacific Northwest is because it's cheaper to produce methanol there, said Eric de Place of the Sightline Institute, a sustainability research and communications center. Methanol plants need abundant sources of water, cheap power, and a reliable supply of natural gas, de Place said. And "there's nowhere you can find natural resources as cheap as the Pacific Northwest," de Place said, referring to the fracked natural gas flowing down from Canada, abundant water sources including from the Columbia River, and inexpensive electricity relative to other areas. "When you think about methanol from a cost perspective it makes complete sense that they would want to build the world's largest methanol plant here." "When you think about methanol from a cost perspective it makes complete sense that they would want to build the world's largest methanol plant here," de Place said. In addition to the plastic and other products produced from methanol in China, it is also being looked into as an alternative fuel, de Place said. "There's almost no limit to the amount of methanol China could want to produce," de Place said. Methanol plants are being constructed all over the U.S., but have until now been concentrated in the Gulf Coast in Texas and Louisiana, he added. And because China agreed to enact a carbon-trading market in 2017 to lower its carbon emissions during the United Nations climate conference in Paris, France, last December, it will likely increasingly be looking for ways to lower emissions at home. As methanol production continues to grow in the U.S., the Pacific Northwest could become an increasingly big part of that growth if the two other refineries are approved and built. If the three refineries were built in Washington and Oregon, the U.S. production of methanol would have tripled. The Pacific Northwest is known for having a strong activist community that has risen up against similar projects that sought to export fossil fuels to Asia before, including natural gas and coal export terminals along the coast. Last year, when oil company Shell wanted to park its Arctic oil rig in the Puget Sound hundreds of kayaktivists opposed to drilling in the Arctic because it would exacerbate climate change protested on the water attempting to block its exit. In canceling the Tacoma plant, NWIW backed out of a 30-year lease with the Port of Tacoma—where the refinery would have been located. The lease had required that the company begin the construction phase on May 1, but Northwest Innovation Works said Tuesday it estimated it would have needed at least three years to finish the refinery’s environmental review. NWIW had already signed a 30-year lease with the Port of Tacoma for the land to build the refinery, but the lease required that the company began construction on May 1. NWIW would have had to pay more in rent even if it wasn’t able to begin construction and at that point could not legally back out of the lease again, Port officials told local media. "Movements against the other two facilities will continue to attract defenders." Mackey said that Northwest Innovation Works’ cancellation of the project demonstrated the power citizens can hold when they work together. He said a planned LNG storage facility also in the Port of Tacoma industrial area is another project that local activists will continue to work against. Resistance against the other planned refineries at Kalama and St. Helens would also grow, Tacoma activists said. “Movements against the other two facilities will continue to attract defenders,” Mackey said. And although NWIW’s Godley said the Tacoma refinery was canceled because of regulatory delays—rather than the opposition of residents—Mackey said he wasn’t surprised.